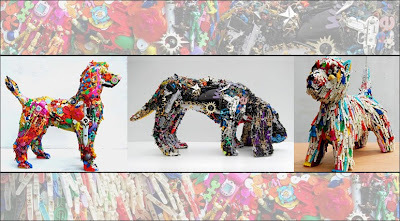 Robert Bradford creates life-size sculptures of animals from discarded toys and other colorful plastic pieces like combs, buttons and clothespins. Interestingly enough, the London-born and U.S.-trained visual artist works as a psychotherapist on the side. Recycling is not his primary concern, but each sculpture certainly keeps quite a few pieces from becoming landfill. Some of the sculptures contain pieces of up to 3,000 toys and sell for $19,000.00, so it's probably not the kind of gift one would rush home to a child.